On Friday, 9th October, the Reverend Anne Skuse was licensed as a Diocesan Curate by the Bishop of Cork, the Right Reverend Dr Paul Colton during a celebration of the Eucharist in the Church of St Mark, Kilbonane (Aherla), County Cork. Anne has now transferred from non-stipendiary to whole time stipendiary ministry. The preacher at the Service was the Bishop of Cashel, Ferns and Ossory, the Right Reverend Michael Burrows. 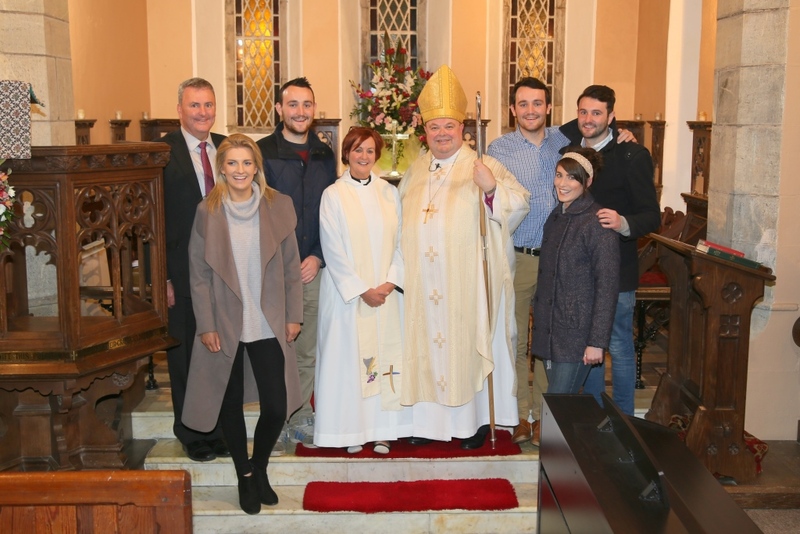 With the Reverend Anne Skuse and the Bishop of Cork, Dr Paul Colton at Anne’s Licensing as a Diocesan Curate in the Church of Saint Mark, Kilbonane, were (l-r) Mr Billy Skuse, Amy Deignan, Ian Skuse, the Reverend Anne Skuse, the Bishop, Robbie Skuse, Niamh O’Regan and Peter Skuse. Anne will serve as a curate, half-time in Moviddy Union of Parishes and half-time in hospital chaplaincy ministry based at the Cork University Hospital, the largest hospital in the State, where the chaplain is Canon Daniel Nuzum. The team also provides chaplaincy services to the Bon Secours Hospital Cork, and to Marymount University Hospital and Hospice. The small church was full to overflowing and many of the congregation joined in the Service in a marquee outside. The organist at the Service was Colin Nicholls. Afterwards the congregation adjourned to Cloughduv GAA Club for a wonderful supper. This entry was posted in Church Services, Clergy, Commissionings, Diocese, LIcensing, People from the Diocese. Bookmark the permalink.